I haven't met anyone who doesn't like to eat crawfish - only a few who don't like to peel them. I live in South East Texas, and we have a few crawfish farms in the area. 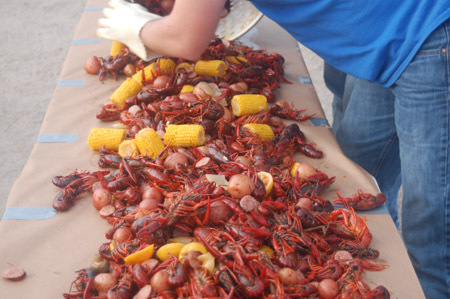 We throw crawfish boil parties every year when spring fades and summer arrives. This year The Smoker King BBQ Team made a new friend at CajunCrawfish.com, and we ordered 60 lbs of crawfish for a crawfish boil we were throwing one Friday night during a BBQ competition. Most of the crawfish I have ordered over the years were pretty dirty when I receive them, and I have to spend a considerable amount of time running fresh water over them in a cooler to remove mud and other things I really don't want to eat. I tell you what, the crawfish we received from CajunCrawfish.com were not only the largest crawfish we have ever seen, they were the cleanest too. I dumped the first 30 lb bag in a cooler expecting to spend the next 30 minutes washing the mud away, and I think a few teammates and I stood there for 15 minutes scratching our heads, simply amazed at how clean the crawfish were right out of the bag. We were amazed at the size too. Several people thought we were having a lobster boil. We ordered the "DANG! That's Big" size and every crawfish we received was huge, and alive. I don't remember pulling one dead crawfish out of the bunch before we cooked them. I can't imagine that will happen every time, but we were amazed. The process of cooking crawfish described on this page is right on the money! I have held many crawfish boils, and this crawfish boil recipe is tried, tested, and developed by me over several years of practice. I use this recipe every time I do a boil. 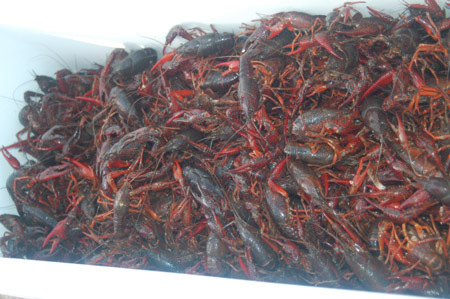 You will see that it uses the perfect blend of Cajun spices and ingredients to create the best tasting crawfish boil you probably have ever had. The crawfish will be perfectly cooked and seasoned to perfection, and your guests will think you are a Cajun cooking genius. 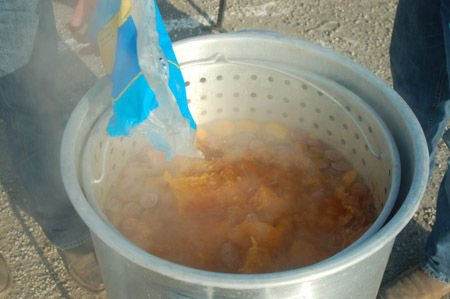 Pot size - an 100 quart pot will hold one 30 pound sack of crawfish, corn corn, potatoes, and sausage. I prefer to use a 100 quart pot or larger because the large volume of water stays hot and returns to a boil much easier after adding ingredients than using a smaller pot. 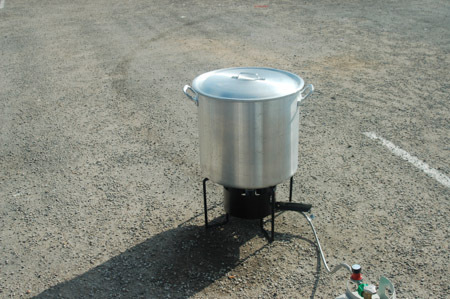 If you don't have a pot that big don't worry, you can always boil the vegetables and sausage first until they are done, remove them, and cook the crawfish alone. The vegetables will hold well in a cooler while the crawfish boils. 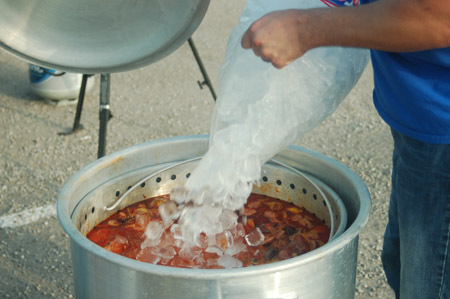 We used a 120 Quart pot for this recipe and the crawfish had plenty of room to swim around! I think we could have easily cooked all 60 pounds at one time. 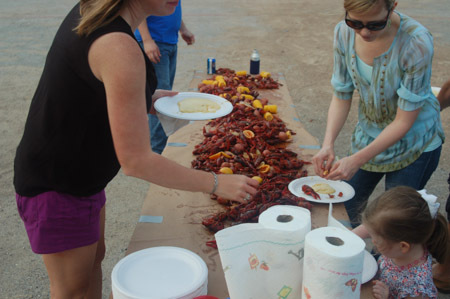 How to do a Crawfish Boil - The Right Way! We ordered the "DANG! That's Big!" size from CajunCrawfish.com because my BBQ team likes big crawfish and I wanted to cook a pot of large crawfish. I hate messing with peeling the small ones. They arrived at my doorstep in Styrofoam boxes, still cool due to the ice packs that were placed in the container before shipping. 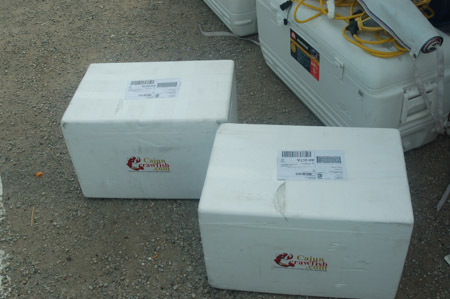 The crawfish is shipped to you in Styrofoam containers. I recommend you open them right when you get them to give them air. Keep a little ice on them but don't drown them in water. Make sure any water in the container can drain. We don't typically save the containers so we carefully poke drain holes in the bottom. You can also dump them in a cooler to let them breathe. Just keep them in a cool place with a little ice on them until you are ready to cook them.. When you open up the box, here is what you get inside. 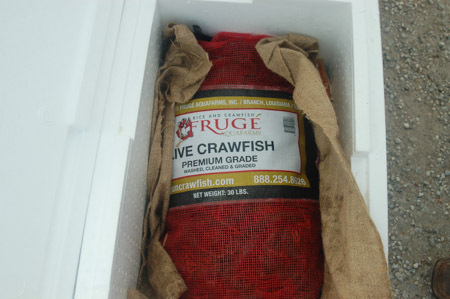 Again, keep the sack of live crawfish in a cool area with a little ice on them so they stay alive. When they are cold, they are almost put into a state of suspension so they don't move a lot and they will stay alive longer. 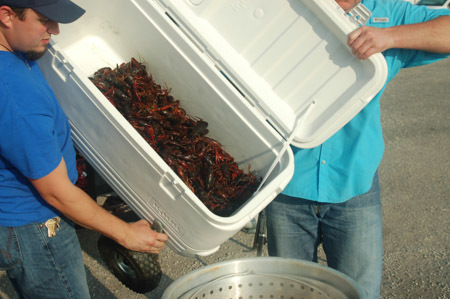 Before cooking, poor the live crawfish into a cooler and fill the cooler with water, covering the crawfish. If they are dirty, you can purge them by filling the cooler with water and draining it a few times until the water runs clear. The crawfish we received from Cajun Crawfish were pretty much spotless so we skipped the cleaning step. Note: I do not use salt to purge the crawfish as I believe it is a myth that salt makes them rid themselves of waste. Crawfish do not like salt, and from my experience they can die if you leave them in salt water too long. Fill a pot of water until it is a little under half full. 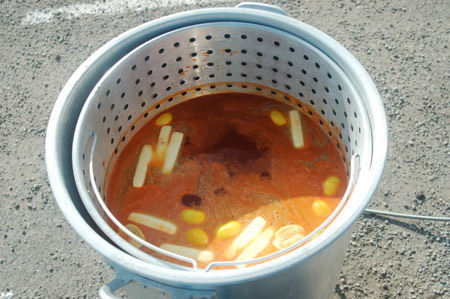 This is a Bayou Classic 1200 120-Quart Aluminum Stockpot with Boil Basket , which I could probably bathe in, so it had around 14 gallons of water in it. We also use a double jet burner to heat this size pot. Both work well together, and the jet burner boils the water pretty darn fast. CajunCrawfish.com also sells pots and burners, and conveniently packages them together with crawfish so you can order everything you need from them too. Drop in your seasoning, butter, lemons, and oranges into the water. Squeeze the lemons and oranges to get the juice out before dropping them into the boil. I like to put the oranges under the basket to give it some space from the bottom of the pot. The butter helps the seasonings stick to the crawfish and tastes pretty darn good too. 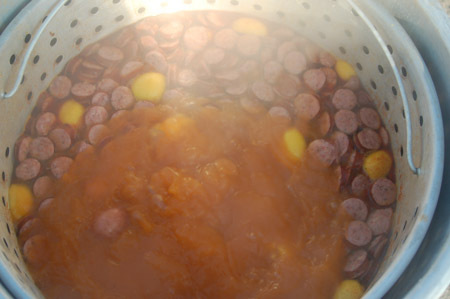 Bring the water to a boil and add the sausage. Put the lid on. Bring it to a boil again then add the potatoes right when the water starts to boil. Bring the water to a boil and let if boil for 10 minutes. After the 10 minutes is up, add the corn. Put the lid back on and return it to a boil. Once the water starts boiling, boil for 5 minutes. I like to throw in some mushrooms too at this point. They soak up the seasoning and taste great! Once the 5 minutes is up, it is time to add the crawfish. Poor them carefully into the pot. Put the lid on and return the water to a boil. Once it starts to boil, boil them for 1 minute and turn the fire off. When you kill the fire, add a layer of ice to the top. I like to add a 10 lb bag to this large of a boil. You want a nice, thin layer of ice on top of the crawfish. They will be floating. 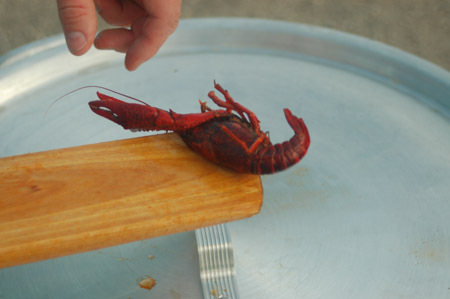 When you rapidly cool off the top layer of crawfish, they begin to sink. When they sink, they fill up with the boil liquid and seasonings. That makes them full of juice for those of you head-suckers out there. Let the crawfish boil sit for 20-25 minutes with the fire off. 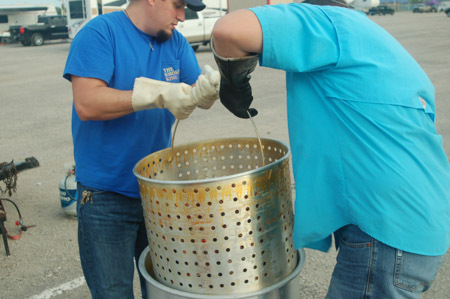 This will allow the crawfish to cook perfectly and soak up lots of seasoning and juice. I don't even look at them until 20 minutes is up. I like to pull one out to test and make sure the meat pulls out of the tail easily, and they taste the way I like them. To test them, twist the tail off of the body and grab the tail meat with you teeth. Squeeze the tail and pull the meat from it with your teeth. The meat should slide out easily if the crawfish are cooked correctly. Once they are done cooking, lift the pot and let it drain. It should drain fairly quickly. Holler at your friends and tell them to gather around the table. 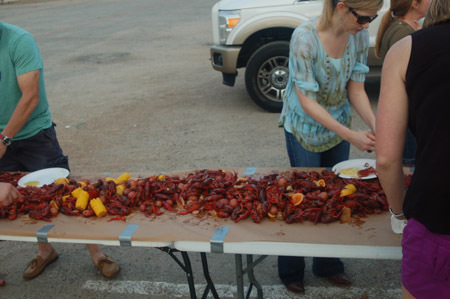 Dump the boil out on a table covered in butcher paper and let everyone dig in. Keep plenty of paper towels and plates handy. We also like to serve honey mustard and melted butter as dipping sauces. Don't forget the beer! CajunCrawfish.com also provided us enough crawfish boil seasoning to boil 60 lbs. I didn't realize they throw in the seasoning when you order crawfish, and I had already prepared for and used my own. I did save their seasoning for the next time I do a crawfish boil though. Note: I am highly impressed with the quality of crawfish supplied by CajunCrawfish.com. I can buy crawfish where I live, but they are usually small and quite a few die before I even get them in the pot. I really had no idea this quality of crawfish was available, and I will order my crawfish from them every time I do a crawfish boil in the future. 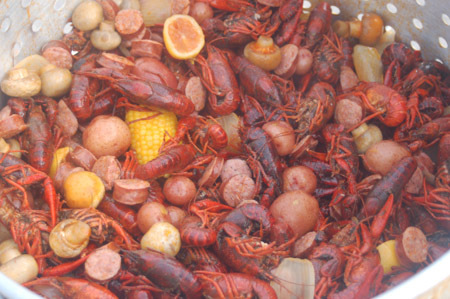 This crawfish boil recipe will cook 30 lbs of crawfish and the normal sides. 3. Leave the crawfish in the water for 5 minutes or so; they will "purge" themselves of mud and other goodies during this time. 4. Drain the water and fill the cooler with water again. Drain after 5 minutes. 5. Repeat this process a few times until the water in the cooler is clear. 6. I do not use salt as I believe it is a myth that salt makes them rid themselves of waste. 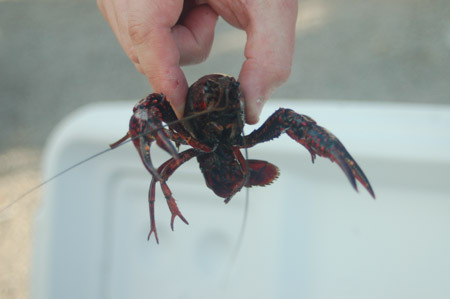 Crawfish do not like salt, and from my experience, they can die if you leave them in salt water too long. 7. After the final purge, rinse the crawfish. 5. Wet Crab Boil 1-16oz bottle. 1. Fill 100 quart pot with 12 gallons of water (about 1/2 full), and place the strainer into the pot. 2. Begin heating the water to a boil. 3. Add 2 lbs. of butter, dry crab boil, wet crab boil, cayenne, black pepper, and salt. 5. Add oranges to the outside of the strainer (cut in half and squeeze the juice into the boil before dropping them in). 1. Cut the potatoes into halves. If they are large, you can quarter them. 1. 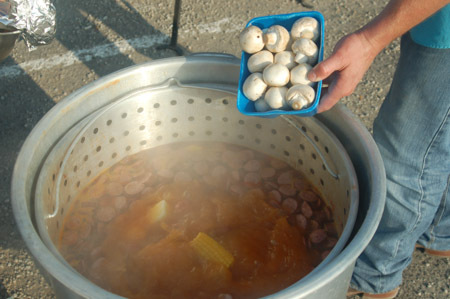 When the water comes to a rolling boil, add the sausage. 2. When the water returns to a boil, wait 5 minutes before doing the next step. 4. When the water comes to a boil, wait 10 minutes before doing the next step . 6. When the water returns to a boil, wait 5 minutes before doing the next step. 7. Add the crawfish and (the mushrooms if you are cooking some too). 8. Bring the water to a boil, cook 1 minute, then turn off the heat. 9. Dump a 10 lb. bag of ice on top of the boil, cover, and don't touch it for 20 minutes. Remove the strainer with the contents of the boil, drain, and pour the boil onto a table covered in butcher paper. Tips: Use the rest of the lemons to wash your hands when you are done. This is a great crawfish boil recipe, and I hope you will enjoy it. If you are adding shrimp, put the shrimp in right when you turn off the heat. They will cook in 20 minutes while you wait for the crayfish to soak up the liquid and cook. If you cook the shrimp any longer they will be really hard to peel.